Mountain Plover /Hawks Aloft Inc.
A sizeable population of Mountain Plovers resides during the spring and summer on Bureau of Land Management land in northern Taos County, New Mexico. Concern over apparent negative population trends, along with the recent petition to list Mountain Plover as a threatened species, prompted a desire among many researchers to learn more about various populations in the western states. 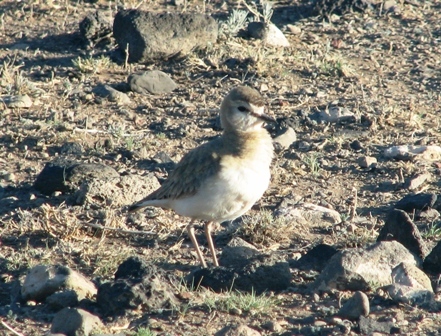 With support from the Bureau of Land Management, we began monitoring the Taos County population in 2001 and initiated a study quantifying plover density and population trends. We conduct annual point count monitoring at 245 survey points and calculate density using a distance sampling and model selection approach. The Taos County Mountain Plover breeding density, as of 2007, is smaller than values reported from other sites in Colorado and Wyoming. However, the large size of the Taos County site (about 50,000 ha) probably renders this population the largest in New Mexico under a single management authority.